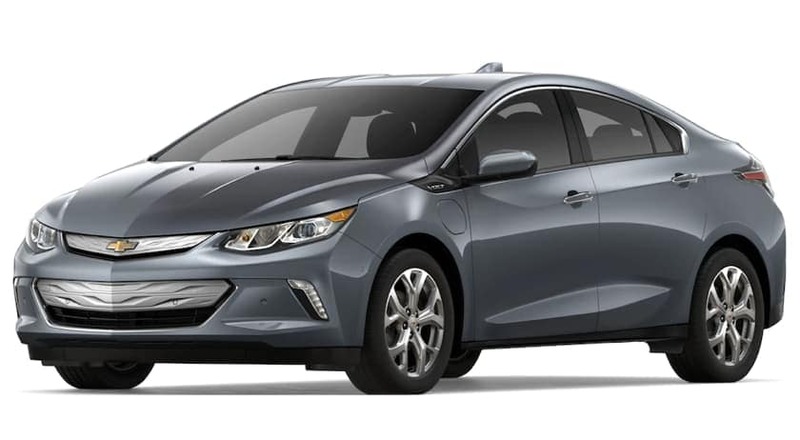 The 2019 Chevy Volt is a state-of-the-art hybrid vehicle offering all the efficiency of an electric vehicle without sacrificing design, performance, or safety on the road. Available in a slew of earthy colors, you’ll be feeling green and sustainable when you ride around in the Chevy Volt! This new compact car is ready to take you from the office directly on a road trip with your family. The Volt has excellent fuel efficiency and can even be plugged in anywhere there is a standard three-prong outlet! You’ll get up to 53 MPGe with a full electric charge and can even replenish the battery by harnessing kinetic energy through regenerative braking while on the road. With a full tank of gas in addition to a full charge, you can travel up to 420 miles in a single trip! Loaded with fun features, you’ll be sure to stay entertained no matter where the road takes you. Access your favorite apps right from the Volt’s touchscreen display or connect your mobile devices to an available 4G LTE Wi-Fi connection. In this age of technology, it’s important that you stay connected, in this vein the Volt certainly delivers. Modern safety features can also be added to the 2019 Chevy Volt. These include features like Available Lane Keep Assist with Lane Departure Warning, Adaptive Cruise Control, and Teen Driver technology. Pick and choose the packages that work best for you to stay safe in your new 2019 Chevy Volt! Stop by McCluskey Chevrolet on Kings Automall Drive in Cincinnati to test drive a new 2019 Chevy Volt today! We’ll be happy to show you all its advanced features and explain the benefits of driving this Chevy hybrid off the lot! The Chevy Volt is a combination of efficiency and versatility, taking both gasoline and electricity and channeling it into energy to keep you on the road! You’ll get up to 420 miles of total range with a full charge and a full tank of gas. On average, owners of new Chevy Volts travel about 1,000 miles between fill-ups if they charge their Volt regularly. If you don’t want to use any gasoline, the Volt can take you up to 53 miles with its battery alone. With the average daily commute being roughly 40 miles, the Volt can more than get you to work and back every day on electric power. The combined MPG for the Chevy Volt is 106 MPGe Electric/ 42 MPG Gas. This gives you the flexibility to use energy efficient electricity when it’s convenient while still retaining the option of filling up if you want to go further. You may be wondering how you choose which power source to use. That’s easy! When you’ve depleted your Volt’s battery and traveled up to 53 miles, the Volt will seamlessly switch from electric to gas power to extend your driving range. This gives you peace of mind knowing you can keep going for hundreds of miles. You’ll never have to sacrifice power for efficiency in the Chevy Volt. With 294 lb.-ft. of torque, you’ll zip on by other electric vehicles and accelerate quickly up hills. Two electric motors work together seamlessly to provide optimal efficiency and conserve your battery’s charge. The Volt works to recharge itself too through regenerative braking. Regenerative braking captures some of the kinetic energy that is lost through normal braking and transfers is back up to your battery. So, if you’re driving a long distance, you’ll go even further! Regen on Demand, a feature of 2019 Chevy Volts, lets you capture even more regenerative braking power. Simply pull on a paddle located on the steering wheel, and you’ll be able to slow your Volt without actually braking. Of course, remember to use your actual brakes if you need to stop abruptly. 120-VOLT CHARGING - A 120-volt transportable charging cable is included and can be plugged in anywhere that has a standard 3-prong outlet. 240-VOLT CHARGING - Standard on Premier models and available on the LT model, the new 7.2 kW onboard charger can provide up to 22 miles per hour charged with an available 240-volt charging unit. That’s up to twice as fast as the previous model! This charging cable requires professional installation. The Volt’s aerodynamic features make it instantly recognizable as a modern electric hybrid vehicle. Subtle curves and finely tuned features create a striking appearance that will be sure to turn heads. The Volt features 17" 5-spoke painted aluminum wheels and body-color power outside mirrors for added style and safety. It comes in your choice of eight colors, most of which are shades of blue and grey, though striking red is also an option. Inside the 2019 Chevy Volt, you’ll find a quiet cabin and a good amount of space up front. You’ll be able to sit up to 5 people, so there’s room for the whole family. For cargo space, the Volt is economical at 10.6 cubic feet, adding to its fuel efficiency. Compared to other compact cars, this may seem low but is actually high compared with other hybrid vehicles. If you’re hauling day to day items like groceries, the Volt’s wide hatch makes it easy for you to unload and load the back. The 2019 Chevy Volt comes in two distinct models; LT and Premier. With Premier, you’ll be able to add on upgrades such as leather upholstery, a heated and leather-wrapped steering wheel, heated front and rear seats, and a power-adjustable driver’s seat. The Volt also comes with two sets of LATCH car-seat connectors on the rear outboard seats, along with an upper tether on the middle seat in the back. The Premier model can also be equipped with additional entertainment and safety features. Technically advanced, the 2019 Chevrolet Volt won’t disappoint you in terms of entertainment. You’ll find an 8-inch digital touch-screen positioned in the front console for your safety and enjoyment. Simply connect apps and music from your smartphone, and you’ll have your favorite entertainment right at your fingertips. The Volt features a Bose premium 8-speaker audio system along with a SiriusXM Radio trial so that you can turn even your most boring commute into a great time! If you’re someone who drives frequently, the Volts USB ports and available 4G LTE Wi-Fi hotspot might be just the thing you were looking for. With the USB ports you can charge all of your devices and then connect to the Wi-Fi via the hotspot no matter where the road takes you. This is great for entertaining your family on long road trips and will ensure you never get stranded without access to the outside world. Besides simply entertainment, the 8-inch digital touchscreen is capable of connecting your favorite navigational app to help you find your way. You can also view stats on your energy use on specifically designed Energy Screens in real-time on the color touch-screen and Driver Information Center located behind the steering wheel. With these, you’ll be able to see exactly how much energy you’re using, how much charge is left in your battery, and where you’re using the most energy so that you can make changes to your driving. The 2019 Chevy Volt has scored an outstanding 5-stars on the NHTSA’s Overall Safety Rating. It also scored 5-stars for Frontal Crashes, Side Crashes, and Rollovers as well. This hybrid was designed and built to keep you safe on the road. Just because it’s a compact car doesn’t mean you and your family should be any less safe every day! Available Adaptive Cruise Control is available on upgraded models which enhances your regular cruise control. Regular cruise control is automatically adjusted to maintain a safe, driver-selected gap between the vehicle detected ahead. This means If the car ahead of you is slowing down and speeding up unpredictably, you’ll still be able to use cruise control without needing to brake frequently. Available Lane Keep Assist with Lane Departure Warning is another available safety feature on upgraded models. This feature helps the driver by gently turning the steering wheel to help avoid a crash due to drifting out of the driving lane without signaling. This feature can also alert the driver with a warning if necessary. Teen Driver technology can be equipped if you’re teaching your new driver safe habits. This built-in system records driving statistics so that parents can review their teen’s trips. This way they can offer feedback and make corrections before their teen gets into trouble.